Birds are everywhere; in the trees, the sky, the water and even on the ground. They are very fascinating creatures and some live in our woodlands habitat. 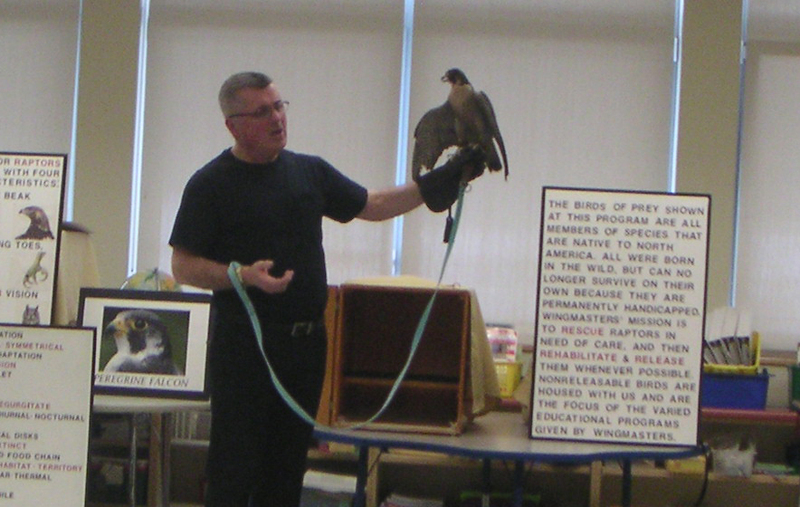 Our kindergartners, who are learning about woodlands habitats, saw a presentation with live birds. The company, who cared for the birds, is called Wingmasters and they brought in some falcons and owls. 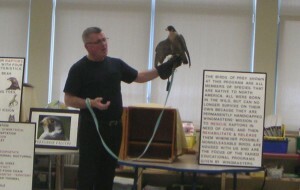 The man, who brought the birds in for the kindergartners, taught about the birds. He told us a lot about these birds, for example, how they have binocular vision and hooked beaks. One of the birds that he showed us was hurt on its wing so it could not fly to catch his prey, therefore he couldn’t live in the wild anymore. The bird’s new job is to teach people about birds. This bird was a falcon. Half of the birds were falcons and the other half were owls, all of them having special needs. The falcons were very feisty and kept trying to fly off. According to the Wingmaster, this means they wanted attention. Wingmasters is a company who saves birds, mostly raptors: falcons and owls. They’re base of operations is in New England and they keep all of the special needs birds at their base site. The Wingmaster company keeps any birds who can’t go into the wild and brings them to schools, like Chickering, to educate kids with facts about birds. Such as, how Hummingbirds are only as big as an ostrich’s eye. Also, jet plane wings were modeled after falcon wings. He brought in five birds, 3 falcons and 2 owls, each of them with a problem that stops them going back into the wild. Unfortunately, we had to leave before he showed any owls but we still obtained some good info and photos of them, such as, how the falcons wings are hard for diving down when their flying, but the owls have a soft wing coat so when they fly, they don’t make any noise. There is also an endangered species of American Kestrel. If any of the birds will be able to survive in the wild after treatment they will let the birds go. We think it is nice there are people out there who will do nice things for animals. Our teacher, Ms Varley, is new to fourth grade this year. So please sit back and relax as you meet our new teacher.